Many of us who run professional detailing operations strive to create a successful business. Those of us already in the business for awhile realized long ago that having a successful detail operation means much more than just knowing how to clean and protect cars; it also means knowing how to run a business. The serious professional detailer who seeks to achieve business success will make a concerted effort in several areas that include detailing know-how as well as understanding of the administrative issues that surround the operation of a business. With strong efforts in each of these areas, your chances of creating a successful operation are greatly increased. I would now like to focus on the first key to success--obtaining proper education and training. Most successful business people, regardless of their profession, will tell you that knowledge is one of the most important factors in their success. There are two ways to gain knowledge: hands-on experience and formalized education and training. Those who rely exclusively upon hands-on experience gather knowledge about detailing through trial-and-error, guessing, making and learning from mistakes and gathering tidbits of information from fellow operators and suppliers. Although it is possible to create a succcssful business without formal training, this is definitely the harder of the two roads. Without the proper knowledge foundation, you essentially are using your customer's vehicles to experiment with products, equipment and procedures that are new to you. If your experimenting leaves a less-than-satisfactory result, the customer is not likely to be happy and may begin to doubt your expertise. Even worse, if your experimenting damages the customer's vehicle, you either have to hide the damage or fix it. Neither of these scenarios is profitable and neither of these will yield a delighted customer who wants to return. Talking with other detailers is an important source of tips and tricks that can help you in your day-to-day operation, but other detailers are not generally a good source for general knowledge about detailing. If your supplier is any good at all, he will be able to answer technical questions and may even provide educational seminars. Unfortunately, you are usually talking with a sales representative who has very little, if any, detailing experience. Often, these people are getting their information passed down from others in the office, not from personal experience. And most suppliers' seminars and workshops are more like sales presentations than formal educational events. One of the main drawbacks of relying on hands-on experience for your knowledge base is that it takes years to assemble the knowledge base that helps build the confidence that commands respect from customers and allows you to charge a premium price for your service. Although money is not the only ingredient for true success, I think most of us would agree that having enough money to live the lifestyle we desire is a very important part of success. If you don't have the knowledge and confidence to do excellent work, how can you make enough money to be successful? It takes years for an operator to gather the same amount of knowledge and information through on-the-job experience that another operator can get from a single formalized training and education event. Usually, those years of information gathering are also years of limited income because you lack the knowledge and confidence to charge an appropriately higher price for your service. I am not saying you will not be successful without training, but it sure helps. The best way to get yourself up to speed from the start is to invest in a high-quality formal training program. A good program will not only teach you how to do detailing, but also how to run a detailing business. A full understanding of the art and science of detailing indudes knowledge of the equipment and chemicals that make the job easier and more effective, knowledge of the numerous surfaces on the vehicle and effective and efficient procedures to clean and protect all of those surfaces. This information alone, however, is not enough to run a successful detailing operation. You also need to have information that will help you master good business administration practices as well. These include creating a professional image, designing a pricing and packaging scheme that assures a good income for your work, planning and implementing a marketing scheme that efficiently and effectively draws customers to your business, and understanding how to take care of those customers once you have them. In short, there's a lot to know. To acquire this information, go to sources who are respected in the industry. There are a number of good schools around the country that specialize in teaching automotive reconditioning. The trade magazines have some advertising on the subject, and the Internet is another great way to find and research these schools. Be forewarned that a good training experience will not come cheaply-expect to pay anywhere from several hundred to several thousand dollars for good information. If it seems too good to be true, pricewise, it probably is. That is, if the price of a good education seems low, it's probably not a complete education or it's more of a sales opportunity for the company providing the "training." If travel to a detailing school is impossible for you, consider purchasing informational products from the same schools. There are excellent videotape training programs that show you how to detail and come with manuals that help you understand how to run the business. These will not substitute for the benefits of hands-on training, but it is far better than receiving no training at all. Once you have received your formalized training, it's time to put the learning into practice. Sometimes, when we receive too much good information at one time, we find it difficult to process that information and put it into practice. Another common problem is analysis paralysis, in which a person spends so much time trying to figure out the best way to do something that nothing gets done. In order to avoid the feeling of being overwhelmed with all the information that you have just learned, set up a strategic plan to implement the information in simple step-by-step fashion. Create small weekly or monthly task lists that help you focus your efforts and your vision of a successful, smoothly running detail business will quickly unfold. Usually, a formal training experience is completed with the presentation of some kind of certificate of completion. Display this certificate with pride in an area that is conspicuous to your customers. Although such a certificate is not a legal document indicating that there is some kind of institution backing up the certification in the event of customer dissatisfaction, I believe that it is OK to describe yourself as being a "certified" detailer. If anybody ever asks, just tell them that you, unlike many other operators out there, spent the time and money to receive formal education and training in your craft. Just because you have a certificate of completion from the finest detail school in the country doesn't mean you'll know everything forever. This is where the experience really pays off. Part of your experiential learning will come in the form of practicing what you have just learned. A good school will provide you with knowledge background, hands-on demonstration and some supervised practice; but after that, you're on your own to master the skills you have just been taught. You will also develop your own particular preferences regarding equipment, chemicals and procedures. You will also find that the detailing industry is constantly changing and improving. It is important to keep up with these changes by reading the trade magazines, attending the trade shows and staying in touch with your detailing school. I also strongly recommend becoming friends with your local detailing competitors. Some operators understand the importance of cooperative competition, a philosophy that recognizes that there are plenty of vehicles that need care, so detailers should work together to increase their business success instead of trying to run each other out of town. Working together means sharing information, tips and tricks with your fellow detailers. You will find a wealth of information out there among detailing technicians. Bits and pieces of information you receive from other operators can be held up against the light of your formal training for initial validation. The information that seems good can be added to your training foundation. There are numerous benefits to obtaining formalized training in the detailing trade. Not only will you learn how to detail vehicles more effectively and efficiently, but you will also learn how to run your business in a manner that increases your likelihood of success. Prentice St. Clair is a San Diego-based consultant to the automotive reconditioning industry. 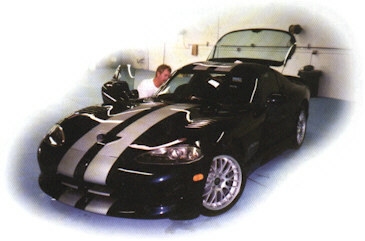 He is the author of a videotaped training series on detailing and also teaches detailing. He can be e-mailed at pstc875437@aol.com .